Apple has released iOS 8.1.3 download. Mainly full of security and bug fixes, the new release is now available to download for both iPads and iPhones alike. Well, that very much depends on whether you intend to jailbreak or not, because if you are or indeed already have a jailbroken device then you will be disappointed to learn that iOS 8.1.3 plugs the holes that the TaiG, Pangu8 and PP jailbreaks used. That means, currently at least, iOS 8.1.3 cannot be jailbroken. So to answer our earlier question, you probably don’t want to upgrade if jailbreaking is on your mind and if you already have, you should probably think about downgrading sooner rather than later. The reason for all the haste in downgrading is that Apple is currently still signing iOS 8.1.2, meaning the downgrade is a nice and simple affair. Once Apple stops signing it though, well, you’re out of luck unfortunately. 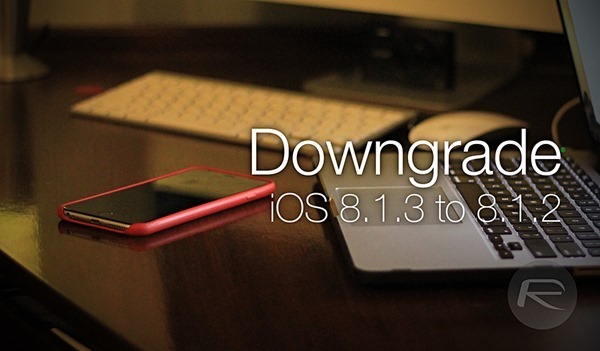 So if you upgraded to iOS 8.1.3 and need to downgrade, what do you need to do? First, make a backup. Whether you use iCloud or iTunes, it’s up to you. Just make one. In fact, make two. Oh OK, one will do. Download iOS 8.1.2 from here. You’re going to need this firmware file before you ask iTunes to do the downgrade. Next, hold the Option key on a Mac or the Shift key on a PC and hit the Restore iPhone / iPad button. Navigate to the IPSW file that you downloaded earlier and select it. Now you just need to sit back and wait for the process to complete and, if needed, re-jailbreak your device. Just remember though, this will only work while Apple is signing iOS 8.1.2 and there is no way of knowing how long it will continue to do so. If you’re going to downgrade, we suggest doing it ASAP. Im having a issue saying “the iphone cannot be restored cause the firmware file is not compatible but i got everything right. i have a Verizon I6 and the IPSW i have is the 12B440 .. anybody else with this issue??? HELP! rst, make a backup. Whether you use iCloud or iTunes, it’s up to you. Just make one. In fact, make two. Oh OK, one will do. Next, hold the Option key on a Mac or the Shift key on a PC and hit the Restore iPhone / iPadbutton. Navigate to the IPSW file that you downloaded earlier and select it. Now you just need to sit back and wait for the process to complete and, if needed, re-jailbreak your device.